INTRODUCING A NEW GENERATION COUNTERMEASURES SWEEP KIT! Sweeps A Room For Bugs And Wiretaps From 400 Khz To 8.5 Ghz! Sweeps a Phone And Phone Line For Wiretaps! Developed For Israeli Military Counter Intelligence! - Diplomatic And Military Grade! A NEW GENERATION OF COUNTERMEASURES GEAR! We are happy to be introducing a new generation countermeasures kit, The ACS-007 Advanced Countermeasures Sweep Kit. The ACS-007 has an incredible sweeping frequency range of 400KHz to 8.5GHz. This advanced system includes a hard shell carry case, RF Probe, IR Probe, all new phone line tone injection/locate unit and much more. The ACS-007 is custom manufactured in Israel by a leading Israeli military countermeasures contractor and is military and diplomatic grade. Easy And Quick To learn And Use! These new generation high-end Countermeasures Kits Will Sweep A Room From 400 KHz to 8.5 GHz for bugs and wiretaps.The System comes with the ability to sweep a phone line. You also have the ability to sweep with the IR probe for IR sweeping. (Light beams, especially lasers, provide an excellent method for carrying audio intelligence and are not detectable by RF -radio frequency detectors.) 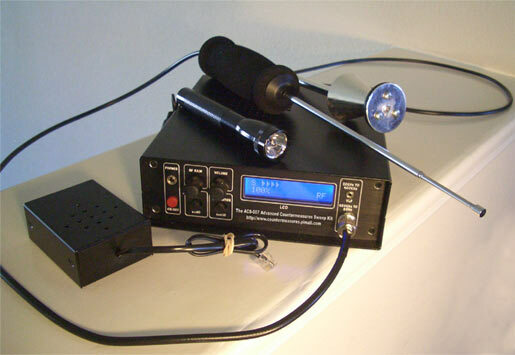 If you need to upgrade your existing countermeasures gear to move up to the ability to handle advanced countermeasures sweep jobs, this is the latest testing equipment you want and you will love moving up to it. If you are considering adding professional countermeasures sweeping to your existing investigative or security agency services, we highly recommend this new state-of-the-art equipment that's a fraction of the cost of similar packages. Since 9-11, countermeasures sweep services has boomed and now is the time to start offering it! This is the ultimate equipment to use! Countermeasures services are typically billing out from $300.00 to $400.00 an hour. Your average domestic sweep case is from $600.00 to $900. Your average small office sweep case is from $1200.00 to $20,00.00. You'll be in a unique position to offer advanced countermeasures sweeping services for both domestic cases and business cases to clients and leave the hotdogs with $89.00 bug detectors in the dust. The first one or two cases will pay the cost of this unit and then everything else is pure profit! Nothing like this has ever been introduced to the US market before at this kind of pricing! We know you are going to love using this product. The complete contents of this page including HTML coding, java script, wordage and photos are copyrighted.